Just something that made me smile today. 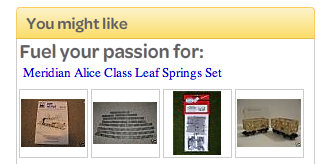 eBay, keen for repeat business, has picked out some items I “might like” based on past purchases. Unfortunately its choice of language isn’t quite right for the last item I bought. Or perhaps some people do have a passion for leaf springs?